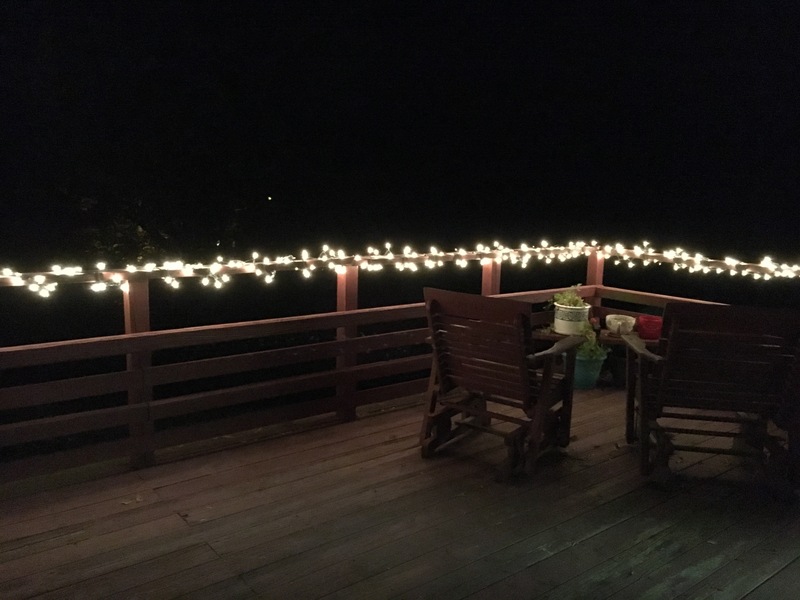 I’ve been thinking about putting year round white lights on our deck for years. I’ve looked at Pinterest pages, decorating magazines, and read descriptions in romantic novels. But thinking about it was as far as it got. It seemed like too much. Then last Friday my daughter was having an outside birthday party. We had agreed to get a fire pit (I actually “gave” one to my husband last Christmas but he had never picked it out) so she and her friends could make s’mores and listen to music. I had thought about putting lights out, but hadn’t done anything about it. The party was at 7pm. I got off work at 5pm and headed straight to Wal-mart. Thirty minutes later I had five boxes of indoor/outdoor white lights ($15) and was headed home. By 6:30 I had them plugged into each other and wrapped around the top rail. It was (is) beautiful. I am sitting at my dining room table and looking at them now. They bring me such pleasure, why didn’t I do this earlier? It took an hour and a half total and less than $20 to do something I had wanted to for years. Why did I procrastinate? Why did it seem like such a big project? It may not be as ornate as others, but it accomplishes what I wanted. This makes me wonder, what else am I procrastinating on that would actually take very little effort? What other “big” projects could be accomplished with simple acts? I have much to ponder. Glad you finally got your lights. I think any project looks big at first when it’s really easy. I had some comic book mini posters I’d always wanted to frame and finally got around to getting frames and placing them on the wall. Wasn’t a big deal – I just had to make myself do it!